This is a very interesting book which I recommend highly as a challenging read. The author takes us back over a century to Victorian and Edwardian London where in nasty little workshops the women working in the millinery trade produced the hats to adorn the heads of rich women – many of these hats contained the plumes and feathers of birds and some even were constructed from complete feathered remains. Birds from all around the world were shot and trapped specifically so that their keratin could make women look good. This was a massive industry with its trade tentacles reaching to all corners of the world. These fashions, and this trade, were the impetus for the establishment of what has become the RSPB, the Royal Society for the Protection of Birds. And the moving lights behind this campaigning movement were women – mostly women. In North America, at the same time and for the same reasons, the Audubon Society was coming into being. I knew some of this tale but I found the detail fascinating. In these pages we meet some formidable and successful women. As well as the Duchess of Portland, the SPB’s and then RSPB’s first and longest-serving President, we meet Eliza Phillips (a founder of Croydon’s Fur, Fin and Feather Folk), Emily Williamson (a founder of the SPB in Didsbury, Manchester) but also most notably Etta Lemon a driving force behind the RSPB for decades but also a leading member of the Women’s National Anti-Suffrage League. For also in here, we find the stories of other women campaigners, whose campaigns overlapped in time with those of the early conservationists; the suffragettes and suffragists. There are some brilliant insights into what it must have been like to live in these times, if you were poor or rich, and if you were male or female. The author seems more interested in the sexual politics and fights for justice than the nature conservation story. I would have liked a bit more on that. But I was absolutely fascinated to learn that the question was raised at the SPB’s 1896 AGM about the apparent disconnect between opposing the killing of birds for the plumage trade and the lack of action against shooting of gamebirds. The SPB constitution was ‘clarified’ after that to reflect that the attitude of the SPB was strictly neutral on the question of killing of game birds, and so it remains today (at least so far as the ethics of that subject is concerned) which is why the RSPB, over a century later, would find it difficult (although not impossible) to support a ban of driven grouse (or any other form of gamebird) shooting. I knew this in outline, but I didn’t know the timing nor the characters involved in this clarification. Fascinating. And there were many more insights in these pages. I learned a lot about Mrs Lemon from this book. I did know her name and had a vague knowledge that she had been a driving force in the development of the RSPB but the truth is that she was arguably the most influential of all those who helped the RSPB into existence. She remained important in the Society until her ousting in 1939 and she died in 1953. She deserves to be better known, and to be remembered with admiration, and this book is a fitting memorial to Mrs Lemon. I wonder what those early women movers and shakers would think of the RSPB now? They were essentially animal welfare campaigners rather than nature conservationists – at least that’s how it seems. Although, as the book shows, the focus was on some birds and some welfare issues rather than all. The RSPB moved away from Mrs Lemon’s original focus and became more scientific, more of a conservation organisation and with a much wider scope and power. A meeting between the current leadership of the RSPB and the original leaders of the SPB would be fascinating for both groups and I’d love to hear how the conversation would go. And I am left wondering what the evolutionary pathway was, over more than a century, from the founding to the present. I’m really curious to know what the route was, who were the major players, what and when were the critical decisions. That book is not this book, but I’d like to read that one too. This was a fascinating and fast-moving read. I enjoyed it very much and learned a lot. But I said that it was a challenging read. I probably meant that it was a challenging read for men, or at least this man. It felt as though all the men in this story were either a bit feckless or a bit nasty, and I’d be surprised if that were wholly true. It would be difficult for a man to write a book that showed women in that light without attracting some criticism but I’m pretty sure that reading this book did me a lot of good. 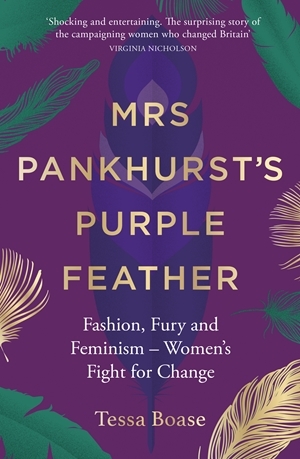 Mrs Pankhurt’s Purple Feather: fashion, fury and feminism – women’s fight for change by Tessa Boase is publised by Aurum Press. PS How about these two connections between the past, more recent times and the absolute present? The Duchess of Portland, the RSPB’s President from 1891-1954 (!!) was born in Murthly Castle in Perthshire not very far from the birthplace of the RSPB’s first female Chief Executive, Barbara Young, who grew up (much later!) in the grounds of the nearby Scone Palace where her parents worked (see my interview with Barbara in Behind More Binoculars for details of her childhood). Murthly Castle is on the Murthly and Strathbraan Estates where SNH has wrongly licensed a cull of Ravens! If the RSPB’s first President, a vegetarian and a hater of game shooting (not a view shared by her husband), could have a word in the ear of the RSPB leaders of today, perhaps particularly in that of the RSPB’s Director in Scotland, Anne McCall, she might be saying ‘Fight this injustice! Fight it in the media, fight it in the corridors of power and fight it in the courts! That’s what we would have done!’. We’ll see.